Hello and Happy Summer Reading! Please post your links in the comments below. I will not be posting until late Friday night. If you submit a link after that it is not a problem and I will add you asap! 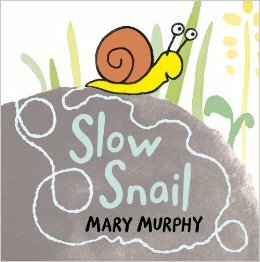 This flannel set is based on the board book Slow Snail, by Mary Murphy. The simple text and bold pictures were just begging to be turned into a flannel story. ​With spring (hopefully!) just around the corner, this is an awesome story to include in a spring, insect, or backyard animal theme.